Well as the summer is drawing to a close Rodeo is going full force. 2 weeks ago at the little britches rodeo Destiny kicked some but and won 3 halters, 2 t-shirts, a ball cap, a metal plus after winning the barrel race, pull bending, key hole and goat scramble she ended up winning "all around cowgirl" for all ages and took home $175 dollars and a saddle pad. I am not sure who was prouder.. Her or her dad. Hayze has been doing quite well too. He is a little more cautious but has a nice style. He will be in the same age category this weekend as his sister.. I am not sure how that will go.. He just bought himself a new horse and he is currently out riding it as I type. The kids are getting good at going out and catching their own horses and getting more independent. This is good news considering the Winter series starts at the end of Sept. Here is Destiny in the practice pen last night. We are off to Patricia little Britches rodeo this weekend and we are going to make a weekend out of it. We are taking our holiday trailer with us and Stacey and her kids and Karla and her family are going to be with us. It should be fun.! Well the shed is complete.... on the outside. We worked on it yesterday afternoon and got it to this point. I still have to do the inside and organize it for the garden tools and lawn mower but it feels good to get the outside done. Our flower beds are going to be great next summer.. However I am struggling with a bad weed in the beds.. I think I got it from the horse poo that I got from the pasture. It is a nasty.. any advice? Well My old college roommate has just returned from Africa and has shared her story with her friends. It is an amazing journey and I am very proud of her for doing it. I wanted to share her story and some of her photos with you. So it was touch and go a few times but I made it back alive!!! I really don't even know where to begin to tell anyone what we saw or what we went through...every day was an adventure! Day 1 involved a close call with elephants...I have never been so scared in all my life!! After running for dear life we managed to get to our first camp safely! Day 2 was a very long day we hiked 12 kms in about 7 hours...the climb up Kili is to be taken pole, pole (slowly, slowly). It was a long day...to top it off...I got sick that night. Day 3 this morning was not good for me, I was sick from altitude and was afraid to go any further...I thought if I am getting sick now it is only going to get worse...Thomas our guide was great...he went through all the symptoms with me and felt it was safe for me to go on...he let me take the lead...and trust me...this day we went pole, pole, pole...slowly, slowly, slowly...I was weak and exhausted, but we made it to our next camp. 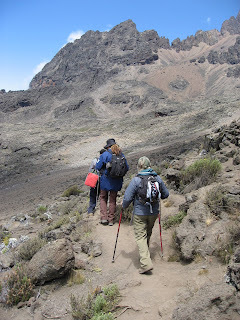 Day 4 I felt much better today, but thankfully Thomas still carried my back pack...we made much better time and got to Kibo Hut, where most of the routes to the summit lead. 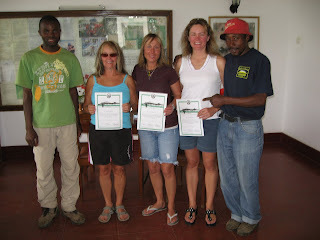 When we signed in and told them we had taken the Whiskey Route (the Rongai Route) to get there...they were much impressed. Day 4 - 5 It was Lana's turn to get sick...we were up with her most of the night...she was much worse than I had been. At midnight they woke us up to make a push for the summit...to be honest...it was awful. It was cold, dark, and with only 50% oxygen, we were weak and fatigued quickly. 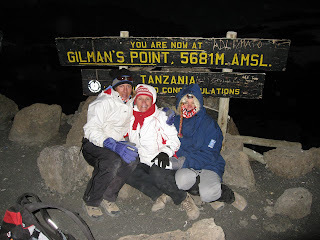 At 6:30 a.m. on August 4, 2007, we reached Gilman's Point. I started to cry, I was frozen and just wanted to go back down. Due to fatigue, nausea and cold we all decided to go back down at this point. 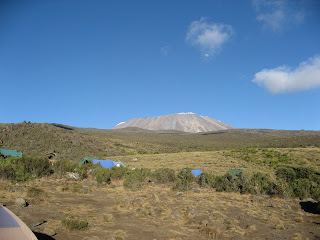 We didn't make it to the summit of Uhuru, but we had made it to the top of Kilimanjaro. Mission accomplished...time to get the heck of this mountain!! Day 6 After hiking for 15 hours the day before, we woke up at a beautiful camp in the rain forest. With only 3 hours ahead of us to get out of the park we were anxious to get going. I don't think I was the only one with tears in my eyes when we finally saw the gates. We had made it!! Dineen is the girl in the middle. Way to go girl.. Great memories. 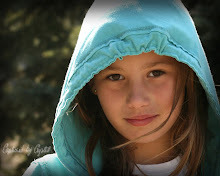 Well the summer has been very great.. the weather hot and doing some activities witht he kids. Boating was fun in July but has come to a halt with the boat doing everything short of exploding the last trip out. It is funny how we all say how fast the summer is going.. I know that I say that every summer and in the winter 2 month can drag for what feels like eternity. I have been juggling the kids from house to house for child care and they have been having a really good time with that too.. Maureen our regular babysitter has just taken them swimming for the last three days and there grandpa Jack is going to watch them again tomorrow. We had Shelby over to babysit one day.. She lives just down the road. and a friend Michelle watch them one day and Hayze finally got to go biking in town for the first time. So they really haven't noticed how hard it has been on me to juggle them around. Next week Hayze is in hockey school and the week after the kids are going to Saskatchewan for a few days and then I will meet them there and we will finish our summer off there.. How lucky are we... ..
Our family and friend garden continues to flurish. We are working on our yard as we can and we just got more sod laid.. It feels that it is starting to come together. Going to get some fencing done and then we can let some animals lose on this overgrown grass then.... it will look good.